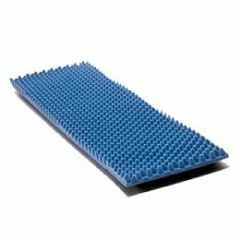 The EggCrate Foam Mattress Pad assures that body weight is allocated evenly, allowing for pressure redistribution. Proprietary Eggcrate cut promotes air circulation for enhanced comfort. The Egg Crate Mattress Pad fits standard hospital or twin bed. 32"W x 72"L, 1.2 density polyfoam. Roller compressed package. This Egg Crate Mattress Pad is a vacuum sealed product. Please allow up to 4 days for foam bed pad to reach maximum thickness. Tip: These egg crate mattresses can be easily cut to fit in favorite recliners and wheelchairs. How do you clean the egg crate mattress? I used to order egg crates for ICU patients that were definitely higher and thicker than those used on the general floors. Is this egg crate of a higher density and thickness than a regular hospital egg crate?